My visit to Hangzhou was a flier. As previously mentioned, it was hot, damned hot. To give context, Shanghai had it hottest day ever on the day I arrived and has never had 3 days of 40+ degrees in a row until now. Hangzhou was even hotter. Too hot to do anything substantial. 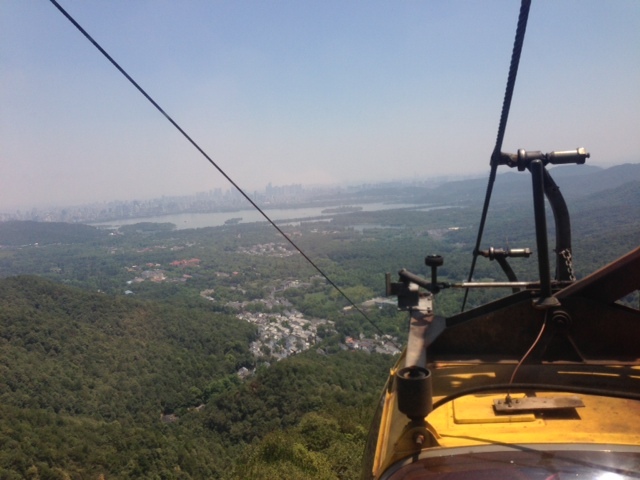 To avoid activity, I opted for a cable car to the Northern Peak. After I’d stepped in and the door shut, I questioned the sanity of this move. I’m in a metal box totally exposed to the sun. Was I just going to be slow cooked in a dangling oven? Fortunately, a fan in the top of the compartment wheezed into gear and kept the temperature at the unbearable but survivable levels. At least I wasn’t walking. The view from the top is good. 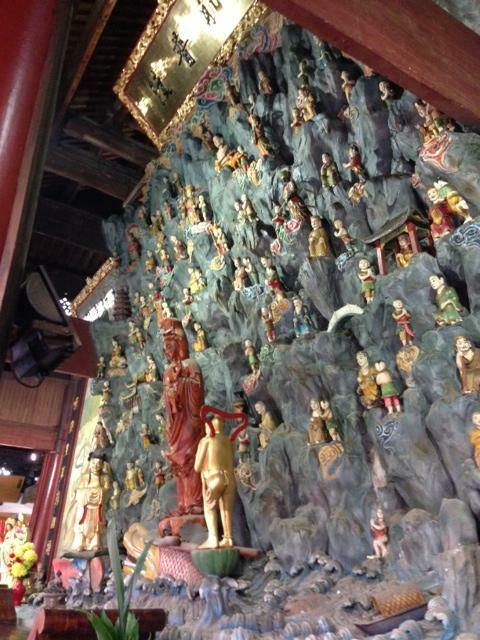 Hangzhou’s a big place and the Northern Peak provides that perspective. It is lucky to have its West Lake, which breaks up unrelenting urbanisation. 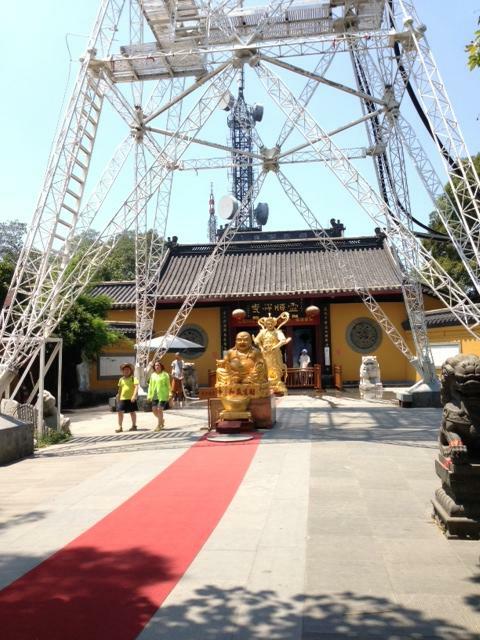 The temple on the peak is compact and is now straddled by a telecommunication tower. Don’t if it ever gets packed, but it’s a fine place to chill out. The back panel reminded me of Richard Scarry’s Busytown. There’s a bell to ring for a price and one or two monks wander around. I did pop into a ubiquitous convenience store to see whether Hangzhou had any of its own beer on offer and was presented with a couple of choices. All I know about Siwo is that it is from Hangzhou and that it is as bland as it gets. 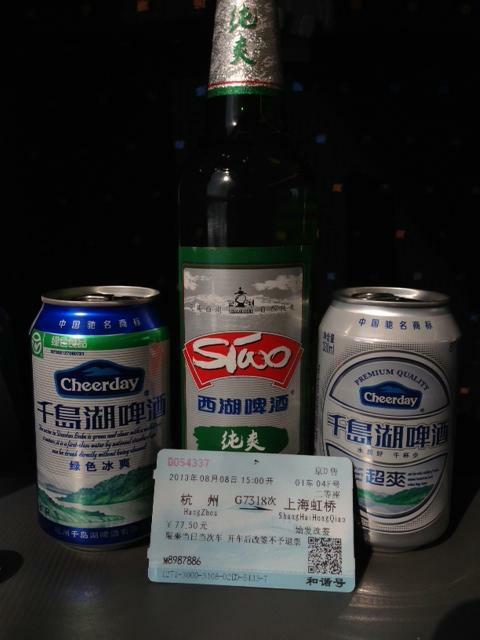 The second beer – Cheerday – is made by the Hangzhou Quiandaohu Brewing Co. which also makes Lucky Beer. Lucky Beer is the beer in the green Buddha bottles you see in bottlos in Sydney from time to time. The key to Cheerday, according the beer can hyperbole, is the water for which the town of Qiandoahu is famous. Nongfu Water, which is widely available throughout China also comes from here. Cheerday was yet another bland lager but at least I knew the water was clean. 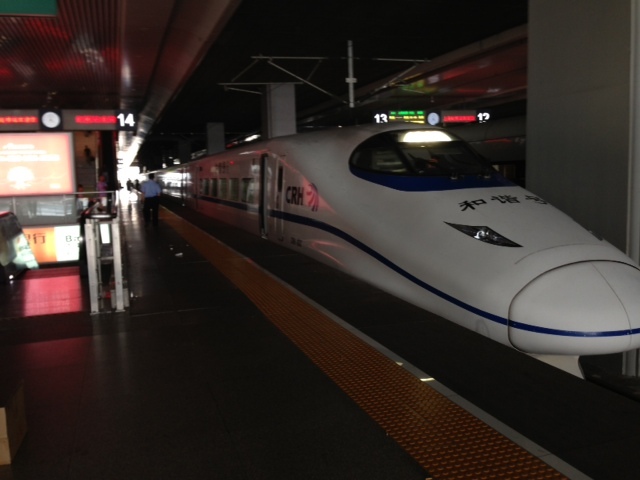 I travelled to Hangzhou by bullet train. 1 hour and 4 minutes to do 170 odd kms. There’s a 48 minute version with no stops. How good would one of these be in Oz? Imagine a Newcastle to Sydney version. It’ll never happen, though. One reason why it works between Shanghai and Hangzhou is that there are no hills. Flat for 180kms – not a bump. Bit hard to put one of these through the Hawkesbury. Great way to travel and heaps more reliable than the planes in China schedule wise.